We all have a lot of them. A few of us have some that seem to radiant in our craft, but for the most part they're out-shined by the yarn and product in almost any case. I am speaking, of course, about the workhorse of knitting (thought that was you didn't you?!) -- the knitting needle. Most of their surface is covered in stitches. They are not the focus of the work. Often they are made of a rather non-descript material (silver or bland bamboo come to mind?). But let's be honest -- not a single stitch would be made without them. You cannot begin a single knitted item without them. So it is easy to miss them altogether -- until you need one and cannot find it. This is the scourge of the knitter -- we misplace them everywhere. They fall out of WIPs, disappear from knitting bags, and take vacations in the deepest and darkest recesses of your favorite couch. Being round, they roll under or behind things. I am amazed I can ever find one at all. 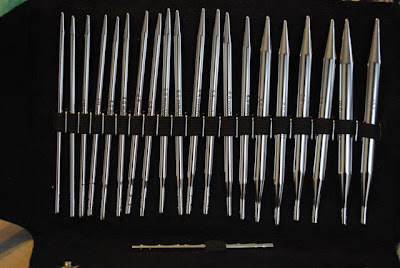 If you spend 5 minutes or more searching for a knitting needle, then you may be in need of a better knitting needle management system. You might also be in need of a better system if your stash of needles has outgrown your current mechanism for storing them, if you have multiple places you store them, or you simply have no method for storing them. First: Gather all of your needles. ALL of them. Those that are in the couch, have rolled behind the refrigerator, in your winter coat pockets, between your car seats -- SEARCH EVERYWHERE! Now, I should preface the rest of this with the note that I am lucky enough to have a craft room -- but I think you can manage this with any situation as long as you can keep them all together. This method works best for me, adapt it as you wish. Third: Now you will show these needles who is boss... As you put a set away, catalog it in your Ravelry notebook's "Needles/hooks" page (see the green box in the image at the bottom of this post). Straights (10" and 14"): Pair them up. If you cannot find a mate for a needle, then it is time to let it go. Odds are, it is already in a land fill somewhere or was lost two or three houses ago. (You've tossed your entire house already remember?). Be ruthless -- you can do it! 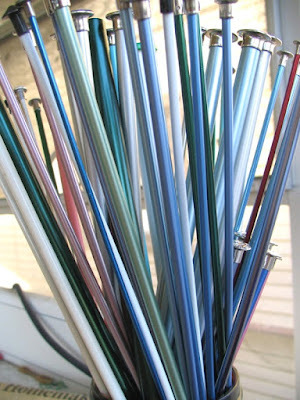 Find a vase of your choosing that will fit all of the 10 inch needles and place them in it. Then find another for the 14 inch needles. This solution serves multiple purposes... First and foremost your needles are pretty and make a very appealing bouquet! Second, by placing them point down, you should have the size available to you at a glance on the end. Third, it is EXTREMELY EASY to put them back when you are done with them -- you don't have to find and unroll a needle case, put them back, then roll it back up again. Fixed Circulars - These are perhaps the hardest type of needle to control. By their very design they are nearly impossible to store accessibly. Some people like to store them in those hangy-things that have a slot for each size and which leave the needles themselves dangling out of either side. However, I think the most appealing and versatile way is to use a tackle/lure binder. They're available at any sporting goods store, can be expanded by adding more sleeves, and you can write on the plastic sleeve itself. Store your needles however you think is best. I like to sort mine in sleeves by size and length (i.e. one sleeve for 16 inch size 8 needles and another for 24 inch size 8 needles). This method is very adaptable. Interchangeables: I have never seen an interchangeable set that didn't come with some kind of case. My suggestion is to find it and use it! If you don't like it, there are other options out there via online retailers (i.e. KnitPicks.com etc...). 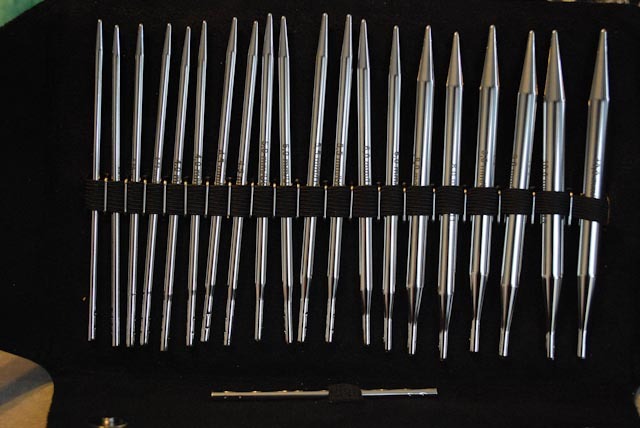 These sets travel best in your bag and if you keep one set on you, you will always have a needle of any length or size you could need in a pinch. DPNs - There are many ways to store these and you should pick your favorite. First, identify any sets without at least four needles and pitch them. 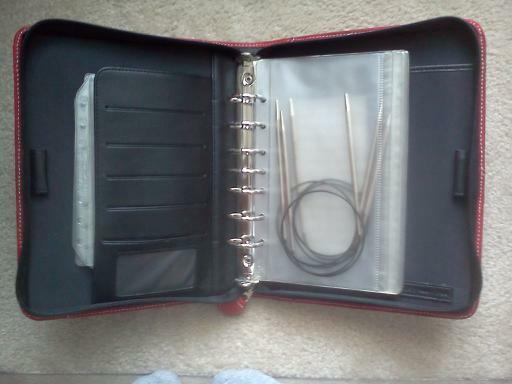 I like to bind the set together with those knitting needle coil wraps like Knitpicks sells. I then place the sets together in another vase by length (i.e. 6", 8", etc..). I have seen others successfully encase theirs in DPN holders or use those empty button cylinders with the screw on lids with a size sticker on the end. Congratulations! Your needles are sorted and you now have a complete catalog of your needles in your Ravelry account. This catalog is available to you 24/7 via the internet or as a printable index card via the "print: pocket card" link on Ravelry (see the red box). Check back tomorrow for the latest WIP and later in the week when we tackle that mess of patterns that seem to be everywhere!